PTFE PCB contract manufacturing services for high bandwidth microwave and RF needs. Capabilities include drilling, routing, blanking, scoring, plasma processing, laminating, edge plating, lead free finishing, inspection and electrical testing. We are pleased to provide Soldering Services. 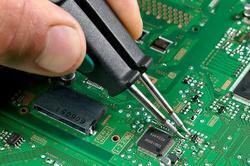 We imply advanced technology for providing the best and reliable Wave Soldering services. We are the first choice of the market and try to meet various demands of our clients. Our services are widely provided to various commercial, industrial and other business clients. These are highly acknowledged in the market and are provided with compete quality assurance at attractive market range. We have been providing wave-soldering services for 18 years. Our advanced wave soldering machine with auto-temperature controlled, auto-flux dispenser and conveyor system provides high quality of bubble-free and sharp soldering points. The Ultrasonic PCB cleaner removes flux residues and provides ultimate shining to the assembled PCBs. All volumes of wave soldering are supported by us. Keeping in view assorted requirements and demands of our honored clientele, we are competent to Wave Soldering Service. To our customers. Our service is accomplished using the advanced techniques. Capitalizing on the ability of our well-trained workforce, we are readily engaged in providing world-class Wave Soldering PCB Assembly Services. A team of well-trained staffs is offering these services as per the thorough demands of our clients. We believe in offering precise solution of client’s needs and assist them accordingly. East India Tech. Pvt. Ltd.
We are offering Soldering Services. Our Wave Soldering Services have semiautomatic operations and our superior technology enables these Wave Soldering Services to perform high quality dry soldering, fluxing and cleaning to produce components with zero channel noise and excellent connectivity. These Wave Soldering Services are offered at leading market prices. When all the components have been mounted on the PCB, the PCB is then put into a Dual Wave Soldering Machine, where the remaining components get soldered. Lead-Free process option available. We have the expertise and requisite facilities to provide Wave Soldering services to our esteemed clients. With this service, we can provide custom design PCB circuits as per the specific demands of clients. Further, we can offer Wave Soldering services at cost effective prices to clients. We are providing Soldering Services. Our company has been acknowledged in offering Wave Soldering services to the clients. Dual Wave Soldering is finest grade material and sophisticated technology under the supervision of adept professionals in compliance with set industry norms.